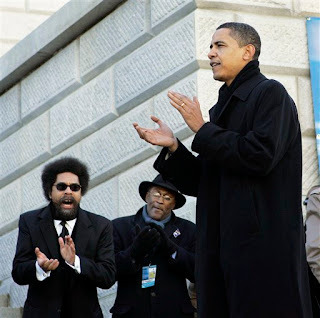 The moral philosopher Cornel West, if Barack Obama’s ascent to power was a morality play, would be the voice of conscience. Rahm Emanuel, a cynical product of the Chicago political machine, would be Satan. Emanuel in the first scene of the play would dangle power, privilege, fame and money before Obama. West would warn Obama that the quality of a life is defined by its moral commitment, that his legacy will be determined by his willingness to defy the cruel assault by the corporate state and the financial elite against the poor and working men and women, and that justice must never be sacrificed on the altar of power. Perhaps there was never much of a struggle in Obama’s heart. Perhaps West only provided a moral veneer. Perhaps the dark heart of Emanuel was always the dark heart of Obama. Only Obama knows. But we know how the play ends. West is banished like honest Kent in “King Lear.” Emanuel and immoral mediocrities from Lawrence Summers to Timothy Geithner to Robert Gates—think of Goneril and Regan in the Shakespearean tragedy—take power. We lose. And Obama becomes an obedient servant of the corporate elite in exchange for the hollow trappings of authority. “When you look at a society you look at it through the lens of the least of these, the weak and the vulnerable; you are committed to loving them first, not exclusively, but first, and therefore giving them priority,” says West, the Class of 1943 University Professor of African American Studies and Religion at Princeton University. “And even at this moment, when the empire is in deep decline, the culture is in deep decay, the political system is broken, where nearly everyone is up for sale, you say all I have is the subversive memory of those who came before, personal integrity, trying to live a decent life, and a willingness to live and die for the love of folk who are catching hell. This means civil disobedience, going to jail, supporting progressive forums of social unrest if they in fact awaken the conscience, whatever conscience is left, of the nation. And that’s where I find myself now. “I have to take some responsibility,” he admits of his support for Obama as we sit in his book-lined office. “I could have been reading into it more than was there. West says the betrayal occurred on two levels. “There is the personal level,” he says. “I used to call my dear brother [Obama] every two weeks. I said a prayer on the phone for him, especially before a debate. And I never got a call back. And when I ran into him in the state Capitol in South Carolina when I was down there campaigning for him he was very kind. The first thing he told me was, ‘Brother West, I feel so bad. I haven’t called you back. You been calling me so much. You been giving me so much love, so much support and what have you.’ And I said, ‘I know you’re busy.’ But then a month and half later I would run into other people on the campaign and he’s calling them all the time. I said, wow, this is kind of strange. He doesn’t have time, even two seconds, to say thank you or I’m glad you’re pulling for me and praying for me, but he’s calling these other people. I said, this is very interesting. And then as it turns out with the inauguration I couldn’t get a ticket with my mother and my brother. I said this is very strange. We drive into the hotel and the guy who picks up my bags from the hotel has a ticket to the inauguration. My mom says, ‘That’s something that this dear brother can get a ticket and you can’t get one, honey, all the work you did for him from Iowa.’ Beginning in Iowa to Ohio. We had to watch the thing in the hotel. But there was also the betrayal on the political and ideological level. Obama and West’s last personal contact took place a year ago at a gathering of the Urban League when, he says, Obama “cussed me out.” Obama, after his address, which promoted his administration’s championing of charter schools, approached West, who was seated in the front row. “He makes a bee line to me right after the talk, in front of everybody,” West says. “He just lets me have it. He says, ‘You ought to be ashamed of yourself, saying I’m not a progressive. Is that the best you can do? Who do you think you are?’ I smiled. I shook his hand. And a sister hollered in the back, ‘You can’t talk to professor West. That’s Dr. Cornel West. Who do you think you are?’ You can go to jail talking to the president like that. You got to watch yourself. I wanted to slap him on the side of his head. Valerie Jarrett, a senior adviser to the president, has, West said, phoned him to complain about his critiques of Obama. Jarrett was especially perturbed, West says, when he said in an interview last year that he saw a lot of Malcolm X and Ella Baker in Michelle Obama. Jarrett told him his comments were not complimentary to the first lady. “I said in the world that I live in, in that which authorizes my reality, Ella Baker is a towering figure,” he says, munching Fritos and sipping apple juice at his desk. “If I say there is a lot of Ella Baker in Michelle Obama, that’s a compliment. She can take it any way she wants. I can tell her I’m sorry it offended you, but I’m going to speak the truth. She is a Harvard Law graduate, a Princeton graduate, and she deals with child obesity and military families. Why doesn’t she visit a prison? Why not spend some time in the hood? That is where she is, but she can’t do it. “I think my dear brother Barack Obama has a certain fear of free black men,” West says. “It’s understandable. As a young brother who grows up in a white context, brilliant African father, he’s always had to fear being a white man with black skin. All he has known culturally is white. He is just as human as I am, but that is his cultural formation. When he meets an independent black brother, it is frightening. And that’s true for a white brother. When you get a white brother who meets a free, independent black man, they got to be mature to really embrace fully what the brother is saying to them. It’s a tension, given the history. It can be overcome. Obama, coming out of Kansas influence, white, loving grandparents, coming out of Hawaii and Indonesia, when he meets these independent black folk who have a history of slavery, Jim Crow, Jane Crow and so on, he is very apprehensive. He has a certain rootlessness, a deracination. It is understandable. “He feels most comfortable with upper middle-class white and Jewish men who consider themselves very smart, very savvy and very effective in getting what they want,” he says. “He’s got two homes. He has got his family and whatever challenges go on there, and this other home. Larry Summers blows his mind because he’s so smart. He’s got Establishment connections. He’s embracing me. It is this smartness, this truncated brilliance, that titillates and stimulates brother Barack and makes him feel at home. That is very sad for me. “This was maybe America’s last chance to fight back against the greed of the Wall Street oligarchs and corporate plutocrats, to generate some serious discussion about public interest and common good that sustains any democratic experiment,” West laments. “We are squeezing out all of the democratic juices we have. The escalation of the class war against the poor and the working class is intense. More and more working people are beaten down. They are world-weary. They are into self-medication. They are turning on each other. They are scapegoating the most vulnerable rather than confronting the most powerful. It is a profoundly human response to panic and catastrophe. I thought Barack Obama could have provided some way out. But he lacks backbone. “Can you imagine if Barack Obama had taken office and deliberately educated and taught the American people about the nature of the financial catastrophe and what greed was really taking place?” West asks. “If he had told us what kind of mechanisms of accountability needed to be in place, if he had focused on homeowners rather than investment banks for bailouts and engaged in massive job creation he could have nipped in the bud the right-wing populism of the tea party folk. The tea party folk are right when they say the government is corrupt. It is corrupt. Big business and banks have taken over government and corrupted it in deep ways. “We have got to attempt to tell the truth, and that truth is painful,” he says. “It is a truth that is against the thick lies of the mainstream. In telling that truth we become so maladjusted to the prevailing injustice that the Democratic Party, more and more, is not just milquetoast and spineless, as it was before, but thoroughly complicitous with some of the worst things in the American empire. I don’t think in good conscience I could tell anybody to vote for Obama. If it turns out in the end that we have a crypto-fascist movement and the only thing standing between us and fascism is Barack Obama, then we have to put our foot on the brake. But we’ve got to think seriously of third-party candidates, third formations, third parties. Rather than criticising Obama, Cornell West should apologise. After all, Obama was and is staying true to his elite education background and position as the frontman for the US Military/Industrial/Congressional Complex. Professor West on the other hand should have known better. As it was plenty of observers and researchers sounded warning bells over various aspects of the Obama deception before he was voted in. Those people were shot down for being naysayers and, as usual, conspiracy theorists. All the signs were there, for those with eyes open enough to see. But 'Brother' West's eyes weren't open. Rather he chose to fixate on the eloquent but empty rhetoric, and the ego-massaging he received. And now all his reactive whining sounds like so much 'sour grapes', coming after his 'dear Brother' cussed him out. I personally emailed Dr West asking him why, in the face of all the evidence, he was advocating for the Obama administration. He never emailed me back. West mentions of himself and Tavis talking about civil disobedience, beginning with ways for both of them to get arrested. Would it ease his conscience any for the role he play in the Obama deception? Does he seek to show his 'brothers and sisters' how with them he is, standing shoulder to shoulder with the brothers and sisters in the hood, those same brothers and sisters that were duped, so easily duped, with the aid of Brother West? Since reading that I've looked avidly for evidence of Dr West putting his money where his mouth is and as yet have not had reason to rejoice at his display of civil disobedience. Writing this response, I've looked online and noticed that several others have seen through the transparency of West's statements. Maybe they like me are looking for the actions too. Slate Spoiler Specials: After - Marissa Martinelli, Rachelle Hampton, and Daniel Schroeder discuss After, in spoiler-filled detail.